Turns out, it’s most of them: Democratic voters put 10 of the 17 names listed at a rating on the “insider” half of the spectrum, including Sen. Bernie Sanders (I-Vt.), the strongest and best-known candidate in the current field who considered himself a political outsider against Hillary Clinton for the Democratic ticket in the 2016 presidential election. 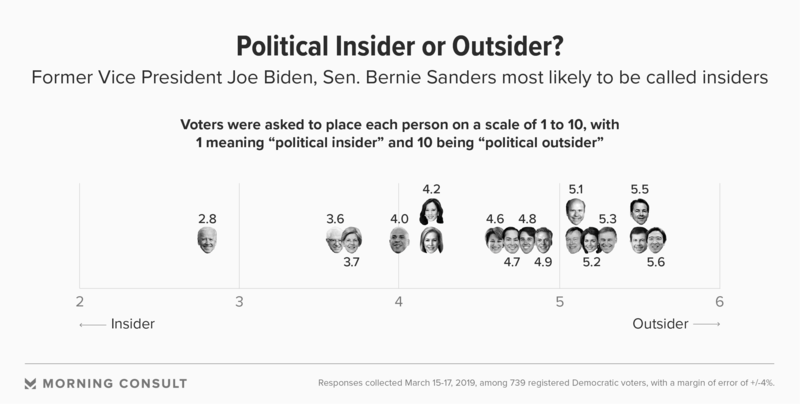 Sanders scored at 3.6 among Democrats, with only former Vice President Joe Biden (2.8) — who has hinted heavily at a run in recent weeks — viewed as more of an insider. Both septuagenarians are leading in Morning Consult’s weekly Democratic primary tracking polls of likely primary voters, despite a strong preference among Democratic voters for someone under 70. Beto O’Rourke, the former Texas congressman, scored 4.8, putting him near the middle of the pack, while Sen. Kamala Harris of California scored 4.2. Sen. Elizabeth Warren of Massachusetts, who’s sought to frame herself as an outsider by swearing off traditional, big-dollar political fundraisers, scored 3.7. At this early stage, whether or not a candidate was considered an insider, and their standing in the horse-race, is highly correlated with name recognition. The greatest share of Democrats have heard and developed opinions about Biden and Sanders, followed by Warren. Lesser-known candidates are more likely to be given outsider status. Pete Buttigieg, the mayor of South Bend, Ind., who gained some notoriety in political circles with his unsuccessful 2017 bid to lead the Democratic National Committee, is the least known, with 56 percent of likely Democratic primary voters saying they’d never heard of him. On the 1 to 10 scale, Buttigieg was one of the least likely to be scored as an insider, scoring 5.5 on the 10-point scale, putting him almost equal to businessman Andrew Yang, a long-shot contender. While profile and personal characteristics certainly factor into voters’ decisions at the polls, the survey shows policy positions on some subjects take precedence. Looking forward to 2020, health care and entitlements topped Democrats’ list of priorities, with three-quarters or more saying it was “very important” that the party’s nominee share their position on those issues. 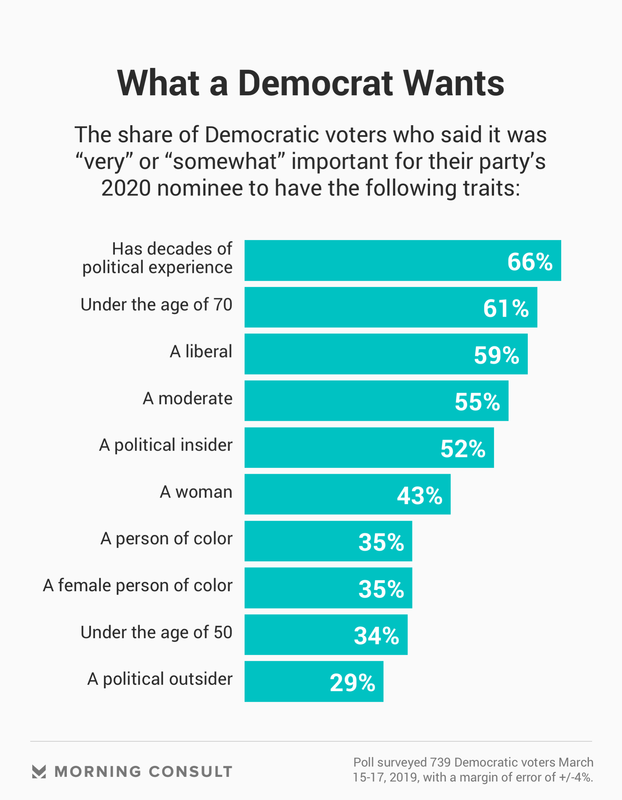 And though policy moved the needle with Democrats more than personal characteristics, polling has also shown those voters are most concerned with a candidate’s electability. A Morning Consult/Politico survey in January found the bulk (44 percent) of Democrats said that when considering their vote, picking someone they think has the best chance of beating Trump in the general election was more important than the candidate sharing their preferred policy positions or values. Joanna Piacenza contributed to this story.